Is there a "minimum" acreage size wood lot? Yes- If your wood lot is less than 20 acres in size, it will require a charge for moving equipment. Generally speaking, wood lots than 20 acres in size do not possess enough timber value to make it possible to absorb the cost of moving. There are exceptional wood lots out there of course, which do possess enough timber value to make it possible not to charge, but that would be determined by a site visit. Is BW TimberHarvesting a licensed Forester? 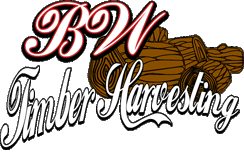 No- BW TimberHarvesting works closely with a licensed Forester, so recommendations are easily made if you choose to request. The Foresters fees will be determined by the Forester, and passed on the Landowner. Your forest is an asset, an investment, wether it be long or short term “investing”. Long term “investing” will return more on your “investment” over the course of years, kind of like letting your 401K grow for many years. Short term will return your “investment” sooner, which may help with unforeseen financial needs. Does BW TimberHarvesting buy single trees? No- The tree, or few trees, near your house, garage, shed. etc. are hazardous, and require removal from the top of the tree down, as not to strike a building, power line, etc. Those trees require contacting a local tree service for removal.